The romance of a road trip flies right out the window when you’re traveling with children. But it is possible to get to your destination without going crazy — you just have to be prepared. 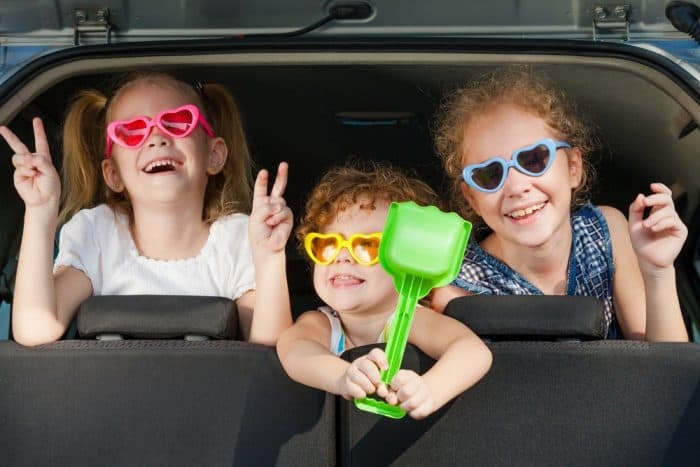 Here are eight travel tips for surviving a road trip with kids. Time is an abstract concept for most children under five, and even older children will only get frustrated when it seems like “soon” never comes. Focus instead on stops and sights along the way, so your kids will have something to keep their minds occupied in the short term and the long term. For example, you can tell them that “When [they] see the [insert visual landmark here], then you’ll be stopping for lunch”. These sorts of phrases are easier for young children to understand than time. 2. Consider renting a bigger car. It may seem counterintuitive to get a larger car for a long road trip, but your sanity is worth the extra money in gas. Leaving the compact car at home and renting a minivan may be worthwhile if you’re sick of your children antagonizing each other on the drive. 3. Pack these essentials for travel with kids. A sheet to cover the back seat, so that Cheerios, crumbs and sand can be easily shaken out. Travel with kids is one time when you’re allowed to use bribes. Keep a stash of snacks or small toys to reward your children for achieving clearly stated goals, such as keeping their hands off their siblings for 30 minutes or for riding quietly for an hour. While DVDs and phone apps can occupy kids for a while, sometimes they need more engaging activities. Friendship bracelets or paracord bracelets are easy to make in the car. Markers designed for writing on glass turn the rear windows into canvases. And they wash off easily with baby wipes. 6. Try the classic car games. Find a license plate from every state. Bonus points for Hawaii! Play road trip bingo. Here are printable bingo cards with pictures of things to spot, like cows and traffic cones. Tell a circle story. One person begins by saying the first sentence of a story, and then each passenger adds a sentence in turn. 7. If you begin to feel agitated, take a break. playground or restaurant before you lose it. It’s more important to arrive safely than to get there on time. 8. Make exercising a game during pitstops. You might have seen parents doing this at rest stops during your last holiday travel adventure or summer road trip. After everyone’s taken their restroom break, engage the kids in some physical activity. Do jumping jacks, run in place, whatever it takes to burn a bit of energy off. You’ll be amazed at how much easier the ride will be after that.